A makeshift posse sets out to rescue those kidnapped by a tribe of cannibals. A western is only as engrossing as its characters, while a horror movie relies on the threat of its villains. Writer-director Zahler nails both elements here to give us a rare hyphenated genre piece that succeeds in satisfying both camps. The blending of the horror and western genres is nothing new. 1959's Curse of the Undead featured a gunslinger from beyond the grave. In 1966 we got the mashups Billy the Kid Versus Dracula and Jesse James Meets Frankenstein's Daughter. Grim Prairie Tales combined the genres for a 1990 anthology movie. In more recent years a host of low budget straight to VOD quickies have pitted cowboys against zombies, werewolves and vampires. 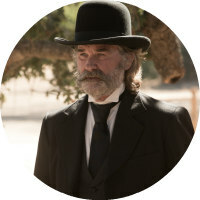 In S Craig Zahler's writing-directing debut Bone Tomahawk, a posse faces off against a tribe of cannibals, but this is no cynical cash in on easily marketed fanboy tropes. 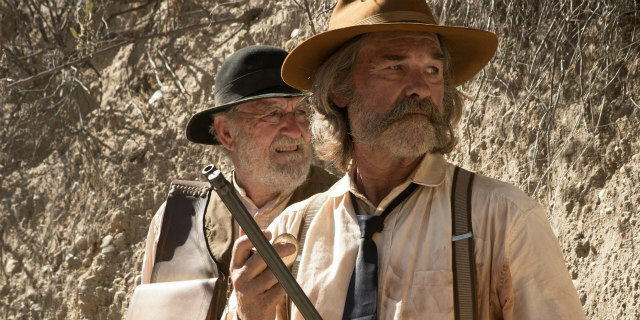 Where Zahler's movie succeeds is in justifying its western setting; here the Old West isn't just some gimmick employed for the sake of a catchy title. The horror element is actually largely absent for most of the film's running time. We get a glimpse of it in the pre-credits sequence, in which a bandit played by exploitation legend Sid Haig is violently dispatched by a figure barely glimpsed in a long shot. Haig's buddy (David Arquette) escapes and heads for the civilised town of Bright Hope, where he runs into the local Sheriff, Franklin Hunt (Kurt Russell), who promptly shoots him in the leg and throws him in the slammer. The next morning, the interloper is gone, along with one of Hunt's deputies and the town's pretty young doctor (Lili Simmons). 'Twas those pesky cave-dwelling cannibals what done it - or 'Troglodytes' as they're referred to here. Hunt - along with aging stand-in deputy Chicory (Richard Jenkins), dandy gunslinger John Brooder (Matthew Fox) and the doctor's crippled husband Arthur O'Dwyer (Patrick Wilson) - heads off to confront the troglodytes and rescue the townsfolk. 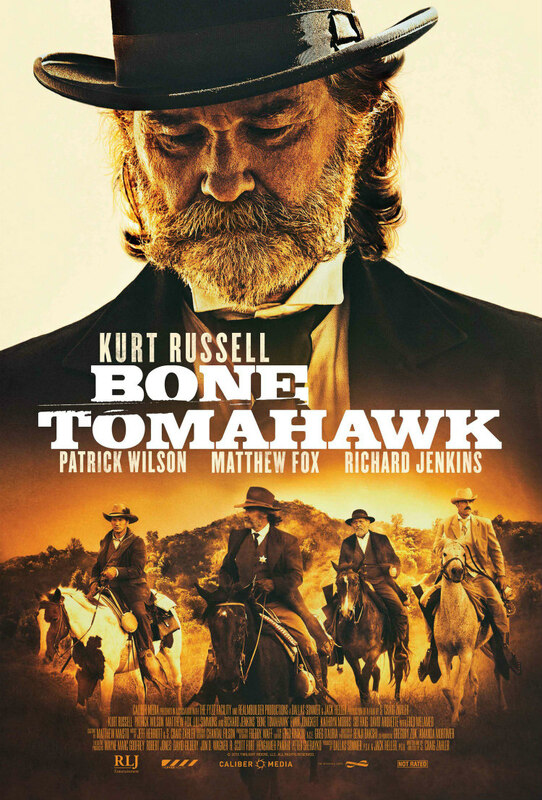 For all its postmodern genre mashing, Bone Tomahawk is the closest we've seen to a classic American western in some time. There's nothing elegaic about any of this; take the cannibals out and this could have been made by Howard Hawks in the middle of the last century. The central quintet is as Hawksian a bunch as you could hope to find. Russell is channelling John Wayne (not for the first time in his career) and Jenkins gives a darn tootin' good riff on the sort of old codger the great Walter Brennan made a career out of essaying. You could imagine Dean Martin or Robert Mitchum playing the immaculately attired but deeply bigoted Brooder, while Simmons has more than a touch of the Angie Dickinson about her. Wilson is the classic seemingly spare wheel that would have been played by whatever handsome stiff the studio was intent on promoting that week. It's Jenkins' Chicory who gives the movie its heart, a character you instantly warm to, and one who provides some hilarious moments with his pontificating on subjects as trivial as how to read in the bath without getting your book wet and the authenticity of a travelling flea circus. The dialogue is warm and witty, but it also gives us a genuine insight into how people spent their time in the Old West when they weren't worrying about being gunned down at any given moment. This is the western dialogue we expected but never received from Tarantino; Chicory's ramblings are the 1890s equivalent of those of Pulp Fiction's Vincent Vega. A throwaway moment featuring the great James Tolkan (whom, I have to confess, I was surprised to discover is still with us) as a saloon piano player is a beautifully droll piece of screenwriting. 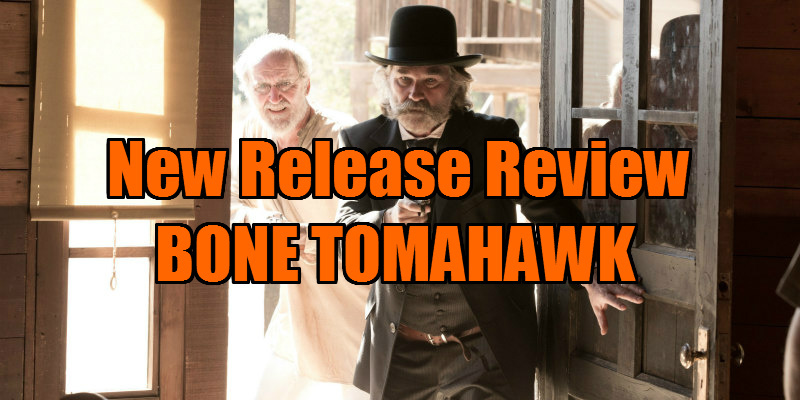 Like the classic westerns of Ford, Hawks and Hathaway, Bone Tomahawk moves at its own pace yet never lags. Zahler isn't afraid to have his film bed down at times to allow us to simply hang out with his characters, and it's a joy to do so. This makes the violence and threat thereof of the final act all the more unsettling and upsetting, as we're faced with the possible deaths of characters we feel we've really grown to know and admire. When we finally meet the troglodytes, they're a terrifying lot, emitting high pitched calls through animal bones lodged in their throats, and smeared in white dusts like the antagonists of a '70s Italian cannibal flick. A western is only as engrossing as its characters, while a horror movie relies on the threat of its villains. Zahler nails both elements here to give us a rare hyphenated genre piece that succeeds in satisfying both camps.